Hello Everyone, how’s your summer going, and now “Back-to-school”? It’s been very busy for me, pretty much trying to juggle so many stuff together! Just take it easy, the weather’s changing in a couple more weeks, so cooling off is on the way, yaaay! These next entries will be dealing with all the technical jargons of cake decorating, servings and the cake cutting ceremony. Everything comes easy with ordering when you already know what you need! While there are different charts and opinions out there about servings, what you’ll find here is my tried and tested recommendations. I hope you find this useful! Now, 1 cake pan iced and decorated is called a cake LAYER, most butter cream cakes are single layer cakes. The professional cake baking pan is usually 2 inches high. Single layer cakes are usually 2 inches high plus the added inch or two of the frosting. Two or more cakes sandwiched with fruit or cream filling is 1 TIER. These days, the trend is to sandwich 3-4 layers to give the cake some height. 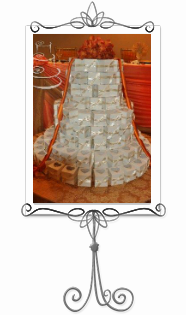 A cake tier is 4 inches or more plus the height of filling and cake covering. Wedding cakes and cakes for big birthdays usually have several tiers. When ordering a cake, three things you might have to consider are: The flavors of cake you’ll like, size of cake you want (depending on your guest count) and the design you want on the cake. FLAVORS are the condiments added to your cake to give it a unique taste. Most bakeries have a large variety of flavors to pick from. Some of these flavors are either fruity, alcoholic, nutty, with vegetables, drinks etc. There are strawberry cakes, orange cakes, rum cakes, champagne cakes, almond cakes, coconut cakes, zucchini cakes, carrot cakes, chocolate cakes, ice cream cakes etc. Also, you might have to think up what SHAPE of cake you want. There are uncountable shapes of cakes now that cakes are made in 3D! The basic shapes are round, rectangle, square, oval and hexagon. There are pans for most other items but the cake decorator can also cut out shapes using the basic shapes. These are called SCULPTED CAKES! If you wanted to make a shoe cake for instance, you might need to ask your decorator if they can sculpt a shoe. CAKE PANS are made to size. The sizes are either even or odd numbered. I usually use the even sizes. I have cake pans 4”, 6”, 8”, 10’’, 12”, 14”, 16” and 18”. The square pans give you added SERVINGS because they are full size. Round and hexagon pans give you a little bit less servings. Think about it this way: round, oval, rectangle and hexagon shapes are actually square shape trimmed on the sides. Here are my own recommendations for number of servings per pan. These are generous slices and not considering single or double layers. The double layered cake will just be extra cake for your guests. 4” cakes will serve 6-8 people, 6” cakes will serve 12-15 people, 8” will serve 20-25 people, 10” will serve 35-40 people, 12” will serve 50-60 people, 14” will serve 100-120 people, 16” will serve 140-160 people, 18” will serve about 200 people. I love ur explanation abt things, jst learnt basic cake stuff last wk and stumbled on ur blog. Thanks Joy, good to know you it made great reading for you! There's more coming about "Cake Cutting Ceremony", hope that's useful as well.